This article is about the Golden Plunger, an item that appeared in The Super Mario Bros. Super Show! episode "King Mario of Cramalot". For the golden plunger that appeared in "Plummers Academy", see Golden Plumber's Helper. The Golden Plunger is featured in The Super Mario Bros. Super Show! episode "King Mario of Cramalot". The Golden Plunger was originally located in the town square of Cramalot, wedged inside the Sacred Sink of Cramalot. It is said that whoever removed the Golden Plunger from the Sacred Sink of Cramalot would gain untold power and be crowned the new king of Cramalot. 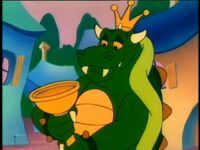 Mario, in order to defeat King Koopa, manages to pluck the Golden Plunger from the Sacred Sink of Cramalot, though he later has the Golden Plunger taken from him by King Koopa. Later, when Mario duels a Golden Plunger-wielding King Koopa, he manages to knock the Golden Plunger from King Koopa's grasp with the Excalibur; what happens to the Golden Plunger afterward is unknown. The full extent of the Golden Plunger's power is unknown, as the only ability of it that is shown is its power to disintegrate objects. In a later episode of The Super Mario Bros. Super Show! entitled "Plummers Academy", another Golden Plunger, called the Golden Plumber's Helper appears. However, this plunger is more of a novelty and did not have any special powers. This page was last edited on February 17, 2018, at 18:17.